Coleus are wonderful plants for both full sun and shade locations. Coleus grow approximately knee-high. These plants are excellent for combination baskets, containers, or borders. Your customers will like how quickly Coleus grow and fill the landscape with color. They mix well with Verbena, Calibrachoa, and Bacopa since all of these varieties have similar cultural needs. Once they flower in the summer, you can either remove the spikes or leave them to attract pollinators. Your unrooted cuttings will arrive freshly cut. You will need to plant them immediately and begin a misting cycle to root the cuttings. This will leech the soil of nutrients, so during the propagation phase use a constant feed of 1/3 the normal recommended dosage of fertilizer until well rooted. For best results with Coleus, we recommend using a well-drained soil with a well-balanced fertilizer and a constant feed program of 200 ppm N. Maintain a pH between 5.8 - 6.2. The EC should be between 1.5-2.0 mmhos (2:1 dilution). While Coleus love full sun, shadier conditions can produce more intense color in the leaves. Coleus produce long bloom spikes on top, but the flowers are not a selling point for this plant. Coleus are grown for their striking foliage, so pinching back the bloom spikes can maintain a more desirable appearance. We recommend that you first pinch Wild Lime 5-10 days after transplanting to your final container. Pinch regularly to encourage branching for height control and shape. 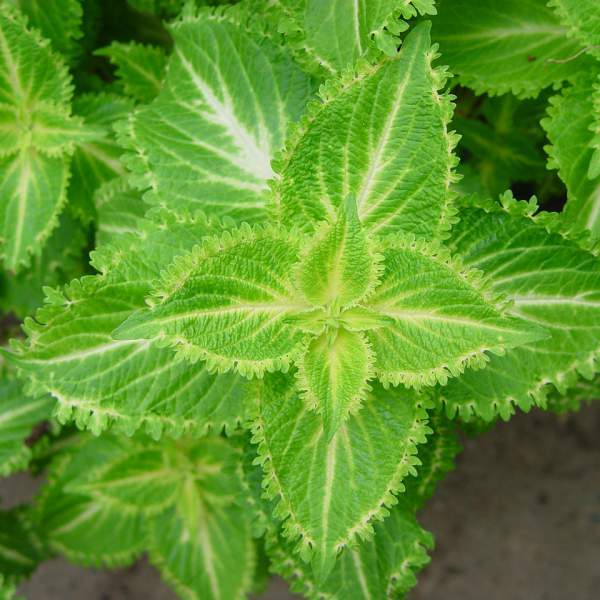 Coleus should be spaced adequately to allow airflow and light penetration between the foliage. Usually 2’ centers on baskets will be enough. Apply plant growth regulators (like Bonzi) to reduce the need for pinching. Aphids and whiteflies are the primary problem pests with Coleus. Wild Lime can be susceptible to downy mildew.To prevent this fungus, lower the humidity and water plants in the morning, allowing leaves to dry out thoroughly in the afternoon. (Horizontal fans at floor level can greatly improve air circulation to facilitate drying and reduce fungus problems.) If spores form (on the bottom of the leaf), treat with Adorn. Watch for botrytis while the days are short. This grey rot is usually associated with wet or humid conditions. You can prevent botrytis by allowing the plant to dry out between waterings, allowing for good airflow in your greenhouse, and spacing to allow the sun to penetrate to the soil level. The most common chemicals used to treat botrytis are Medallion and Banrot. Use them as a drench according to each label’s instructions. We recommend planting 4 starter plants per 10 inch basket. Use a well-drained soil in your baskets and plant your starter plants deep, allowing the ellepot to be completely covered by the soil. If you are planting 4” pots, 1 plant per pot should be sufficient. Plant it directly in the middle of your pot. Pinch Wild Lime 5-10 days after transplanting to your final container. Additional pinches every couple of weeks may be required to shape your final pot. Cuttings vary in size between different plant families, but most can be described as tip cuttings (ivy are leaf-and-eye stem cuttings not tips) that stick nicely in small plug trays such as the 105-plug tray we use (some varieties are better suited for a 50 cell tray, i.e. Angelwing Begonia, Bougainvillea, Setcrecea, etc.). Please do not order unrooted cuttings unless you are an experienced propagator with mist systems and proper temperature control.